Halifax woman first to serve in the Navy while wearing a turban. Before getting the all-clear from her chain of command, Wanda McDonald felt like she was leading a double life. A sonar operator in the Navy, she'd wear her regular uniform to work, but would change into her dastar (turban) afterwards. "I felt like I was two different people for awhile and I just wanted to be able to be myself all the time," she says. Recently, the Halifax resident and master seaman became the first Sikh woman to serve in the Navy while wearing a turban. She converted to Sikhism over three years ago and began wearing a turban in May. At Halifax's Maritime Sikh Society, she sits cross-legged, adjusting her chunni—a ubiquitous South Asian scarf used by Sikh women to cover their heads at temples. She acknowledges that not all Sikh women choose to wear a turban. Her motivation to take the step was underscored by Sikhism's emphasis on gender equality. "It's become a part of me," she says, smiling as people stop by to chat and congratulate her. "I'm just overwhelmed—actually, humbled—by all the responses that I got...it's all been extremely, extremely, positive." McDonald says the Navy's dress manual states women are supposed to wear regular Forces headdresses, keeping their hair in a bun. 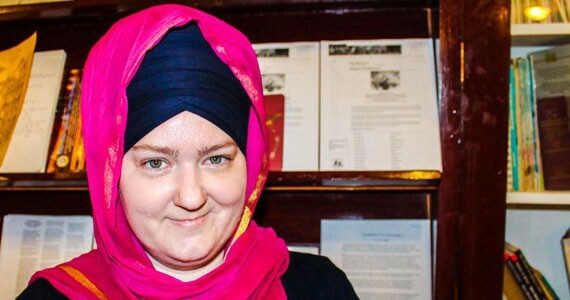 After approaching the World Sikh Organization, which liaised with Ottawa on her behalf, she was given the go-ahead to wear her turban to work. "Women have actually been allowed for two years. We just weren't aware," she says, pointing out that a Sikh woman from British Columbia was the first in the Canadian Forces to wear a turban on duty. With the support she's received, she hopes to inspire religious minorities serving in law enforcement and the military. "Don't let anything hold you back. Don't be afraid to stand out."